First-quarter earnings reports for two companies supporting the commercial vehicle industry reflected different results amid a strong environment for freight and booming truck orders. One supplier of fuel and related services for fleets on the road had a net loss but uptick in revenue while a diversified component supplier saw both its net income and revenue surge. For the period ended March 31, TravelCenters of America Inc. reported a net loss of $10.1 million, or 25 cents per share, compared with a net loss of $29.4 million, or 74 cents, a year earlier. Revenue increased to $1.6 billion compared with $1.4 billion in the 2017 quarter, with an increase in fuel-sales revenue contributing $79 million to the overall increase. At the same time, 83% of its diesel fuel volume was sold at discounts to posted prices under pricing arrangements with its customers, some of which include rebates payable to the customer after the end of the period, the Westlake, Ohio-based company reported. “Our efforts continued to make progress against the combined headwinds of increased fuel efficiency and competition we have been experiencing, and we continued to grow our non-fuel businesses,” TravelCenters CEO Andrew Rebholz said in a statement. The company notched increases compared with the prior year in several segments, including a 5% gain in total tire unit sales, a 44% jump in on-site mobile maintenance work orders, a 9.7% jump in RoadSquad roadside assistance work orders and 51.2% boost in revenues for a parking reservation service. 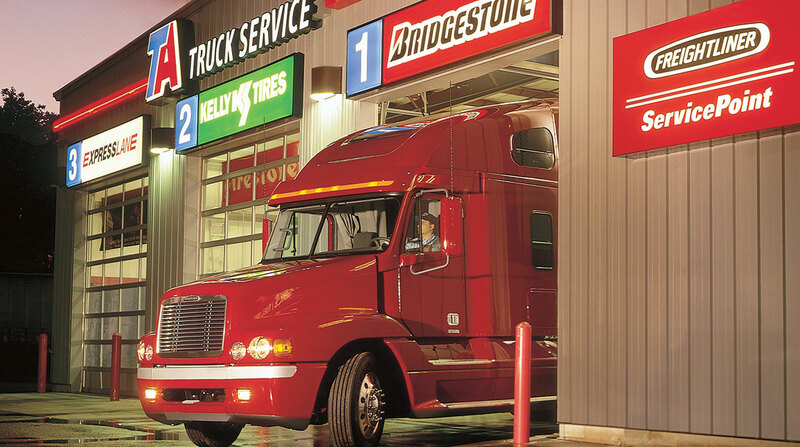 During the quarter, the company had 256 travel centers in 43 U.S. states and the province of Ontario, Canada. Its travel centers included 178 locations operated under the TravelCenters of America and TA brand names and 78 locations operated under the Petro Stopping Centers and Petro brand names. In addition the company had 279 standalone convenience stores and standalone restaurants. Meanwhile, Commercial Vehicle Group Inc. saw net income balloon to $9.9 million, or 32 cents per share, compared with $600,000, or 2 cents, compared with a year earlier. Revenue rose 24.4% to $215.7 million compared with $173.4 million in the prior year period. The increase in revenue reflected higher heavy-duty truck production in North America and improvement in the global construction markets it serves, according to the New Albany, Ohio-based company. Foreign currency translation favorably impacted first-quarter 2018 revenues by $7.1 million, or by 4.1% compared with a year earlier. “North American medium and heavy-duty truck order rates performed strong in the first quarter of this year, reflecting the second-best level in history. These order levels are good predicators that 2018 is likely to be a strong build year as the original equipment manufacturers work to increase production to elevate the increasing backlogs,” Commercial Vehicle Group CEO Patrick Miller said during an earnings call with analysts. “We believe solid trucks fundamentals including pricing, equipment utilization and used truck values coupled with continued economic growth in the United States support this strong truck demand for the full year,” Miller said. The company estimates that 2018 North American Class 8 truck production will be in the range of 300,000 to 325,000 units compared with 256,000 units in 2017. North American Class 5-7 production is expected to be up slightly year-over-year. Commercial Vehicle Group supplies of a range of truck cab-related products and systems for the global commercial vehicle market.